Little could Ethel Wood imagine that she would indeed become an influential woman in Sarasota until her death, still living in what we now know as the Bidwell-Wood House, decades later. For more on the House as well as the Crocker Memorial Church, click over to our Museum booklet. 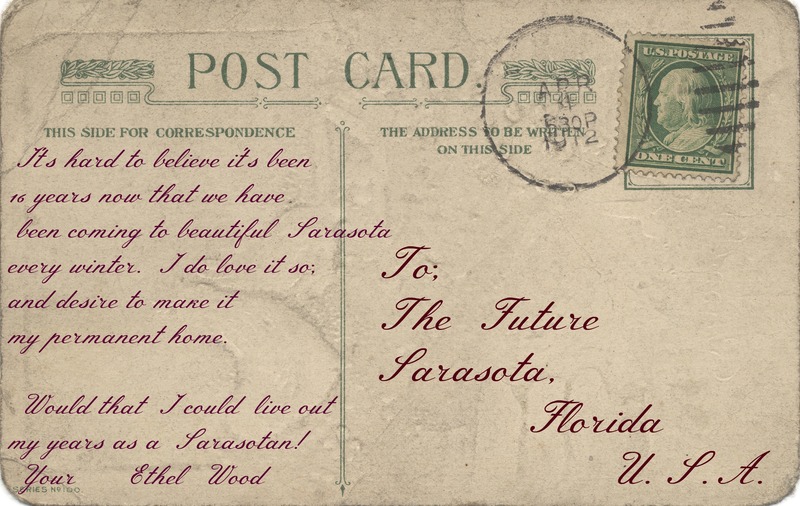 Note: This is a totally fictitious postcard “To The Future”, presented by the Historical Society of Sarasota County as part of its fund-raising activities. The House needs a new period-authentic roof to protect and preserve the oldest residence in Sarasota County, and you can help! Use the “Donate” button in our sidebar, or stop by with a check anytime, Mon-Fri 10 to 2. Our Site Manager, Linda Garcia, will be delighted!